Ready to bring out them gorgeous summer dresses that you'd stashed away? Sunny days are here again, and while we're super excited for the never-ending cocktails, talks and good times under the sun, we can't help but worry about the different skin woes that this season brings with it. Lucky for us, we've discovered a functional skincare brand that not only caters to women, but also men! Scroll down to find our favourite picks from Alainne's kickass range of body mists, aloe gels and more! Getting late for a sudden party plan and want to wear your favourite little black dress? The Roseate Hair Removal Cream will be at your rescue. It will come packaged in a complete kit holding spatula, instruction manual, the cream and the hair remover. If you have sensitive skin, then we say you must go for the Aloe Vera with Green Tea Hair Remover. The hair remover has natural ingredients like Aloe-Vera and green tea that have medicinal and antioxidant properties that’ll leave your skin nourished, moist and soft as a feather. AND, don’t forget to try out the Argon Hair Removal Cream. The product contains Argon Oil that will leave your skin hydrated and naturally fair after each session (win- win). The cream is made with a blend of jasmine and lilies that will make you feel fresh as the summer wind. Whether it is that important meeting or the date night that have to go for, we found quick once a day solution. This sturdy range of pocket perfumes with a classic fragrance will make you feel fresh, confident and will make you feel on top of your game, while you are on the go. Our top picks are Royal – Lush Pocket Perfume and Ultra Marine Pocket Perfume and we are surely adding one to our stash of summer essentials. Ahoy, gentlemen! Smelly armpits and sweat trickling down your face is never attractive. We are sure you wouldn’t disagree. So, we say why not regularly spritz Ultra - Marine Original Body Spray? You can even go for Royal- Lush Body Spray or Top Notch Original Body Spray that will keep you feeling fresh like the summer dew through the day. We will quickly let you in on a fun fact. Most women never forget a man who smells good. Make your pick now! They say that a nice smelling room is therapeutic for even the worst days at work. 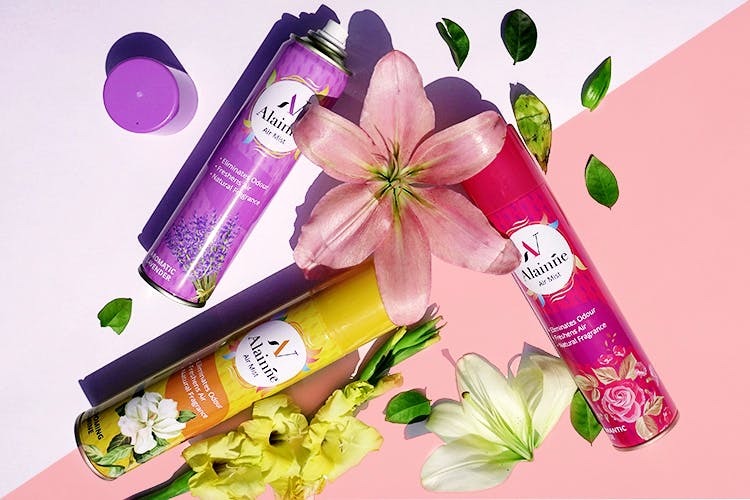 Check out Alainne’s range of air mists in variants like Rose, Jasmine, Lavender and Rajnigandha that will not only be gratifying but will also transform your mood. Experience the kiss of natural smells lingering in the room to soothe you after a rough or long day at work. Checkout their whole range of products here. You can also follow them on Facebook and Instagram for more exciting updates on Alainne.